Autumn seems to encompass so many seasonal changes – if we are lucky we’ll have an Indian Summer followed by a mild Autumn but more often than not, we’ll head straight into Winter before October is out. Nevertheless, the seasonal change brings with it an opportunity to have a bit of a change up in our homes. As it gets colder outside, we say goodbye to the BBQ for another year and hello to candles, throws and soft, warm lighting. The rise in popularity of the Danish concept of Hygge (pronouced ‘Hoo-guh’) doesn’t look to be waning as we all embrace the cosiness of the darker evenings. 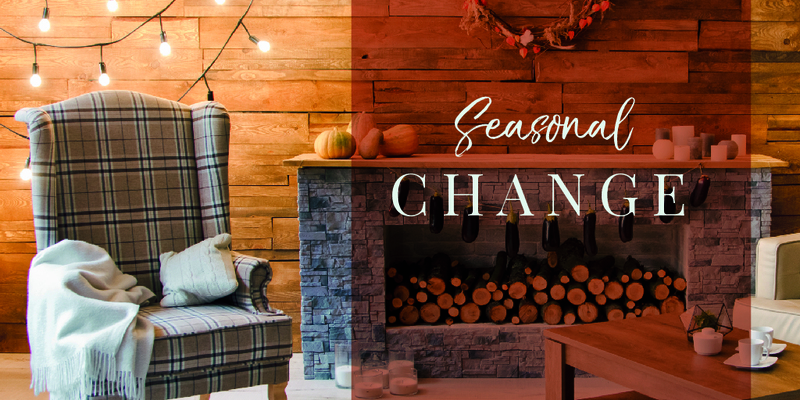 Whether you are selling your house or simply want to create a cosy feel, here’s our top five tips on how to update your interiors to adapt to the forthcoming seasons. When the darker months come rolling in, lighting is key. Think about task lamps and floor lights to create a cosy and atmospheric snug. For me, autumn is the perfect time of year for adding deep rusty hues and warm ochre alongside grey tones – simply swapping over your cushions or adding a different throw can change the look of a room. The ultimate way to create a cosy autumnal space is to light candles – nothing can beat the soft flicker of candle light, even more so when accompanied by a gorgeous scent. You can’t have enough in my book! An armchair, a few candles, a cosy blanket can be all you need to create a ‘hygge’ space to escape to. Let buyers fall in love with your lifestyle! A new season is the perfect excuse for a tidy up (don’t just wait for Spring). The first job on the list is to clean and store all garden furniture!